*When using the YS-110α as an external strobe for the DX-GE5 camera/housing set, check whether the strobe was produced after September 2010 and marked with Ver. 1.1. *The YS-110α produced before September 2010 without marking of Ver. 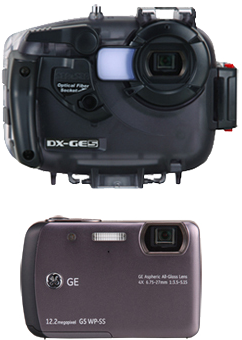 1.1 are not compatible with the DX-GE5 camera/housing set. *Although the G5WP-SS is a waterproof camera, you may not be able to take pictures if the glass in the housing fogs up due to condensation forming on the inside of the glass because of moisture left remaining in gaps between the housing and the camera or similar problems if the housing is used while the camera is still wet or not fully dry. If the camera has gotten wet, wipe off any moisture with a dry towel or the like and allow the camera to dry in a cool place out of direct sunlight for at least 24 hours before use. The DX-GE5 camera is waterproof to 5m / 16ft without it's housing, making it versatile for all outdoor sports activities from water to snow. 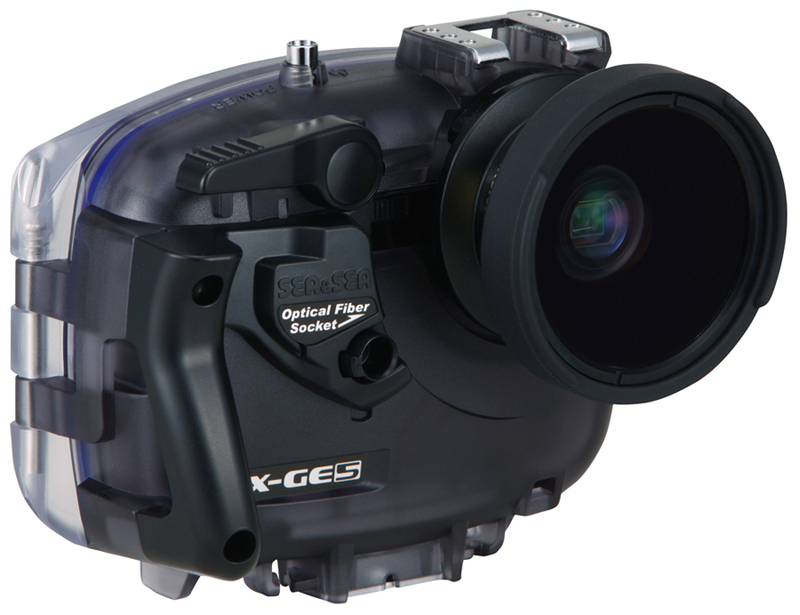 The DX-GE5 housing is rugged dependable allowing full functionality of the camera to 55m / 180ft. The optional Wide-Angle Conversion Lens for DX-860G52115 can be attached/removed even underwater. With the wide-angle conversion lens for DX-860G. High definition CCD – 1/2.3-inch primary color CCD with 12.20 effective megapixels and 4x optical zoom lens (38 to 152mm). 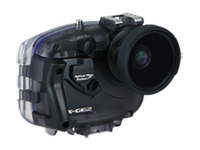 Equipped with underwater photo and video modes ideal for capturing perfect underwater images or video. 2.7-inch LCD monitor (with an automatic brightness adjustment function). Approx. 230,000-dot LCD monitor that's easy to see when checking photos while shooting or during playback. Automatically adjusts the brightness of the LCD screen to match the amount of ambient light in the area. Equipped with a recognition function (for faces, smiles, and blinking) and blur reduction function. Compatible with highly sensitive ISO 1600 photography. Removable macro diffuser. Adjusts light from the internal flash to make it uniform during macro shooting. When you turn the retractable cable socket, the fiber-optic cable socket slides and is aligned with position of the built-in flash and fixed. Luninour stickers help identify the buttons. The housing rear caseback can be opened/closed while the housing is mounted on a camera tray. Strong and durable build, with a depth rating of up to 55m / 180ft. *The YS-110α can be made to be compatible through a firmware update. For details, please inquire at a representative sales office.